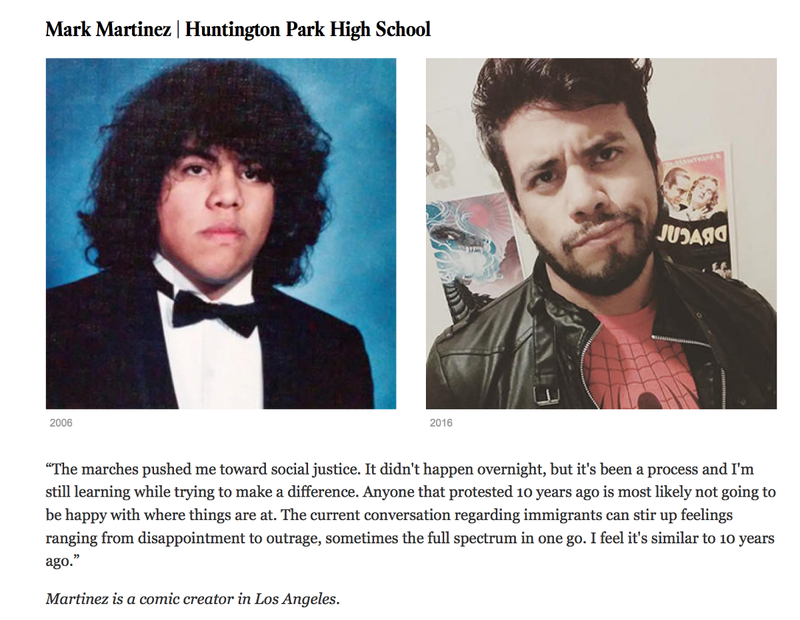 During an election year marked by anti-immigrant rhetoric, we wanted to check back with these young people who had vowed to change immigration laws with their votes. 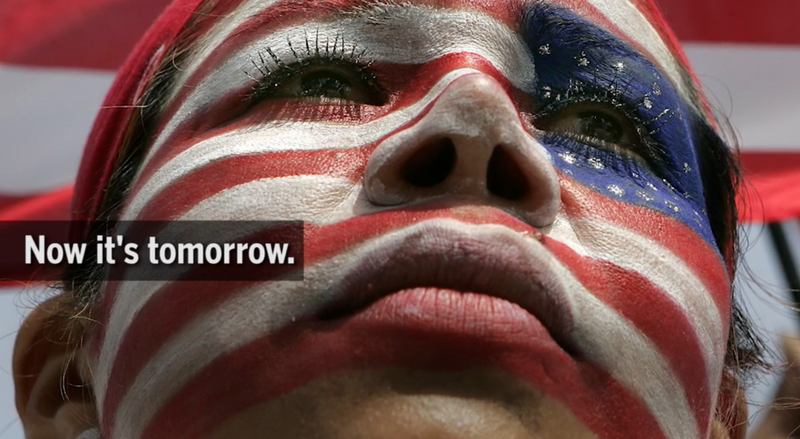 Immigration reform had failed to move forward in the ensuing decade. How had the marches shaped their trajectories, if at all? But they were hard to find. No studies had been done on this specific cohort which has been challenging to track because the movement did not stay cohesive. A screenshot from the social video using archival images. 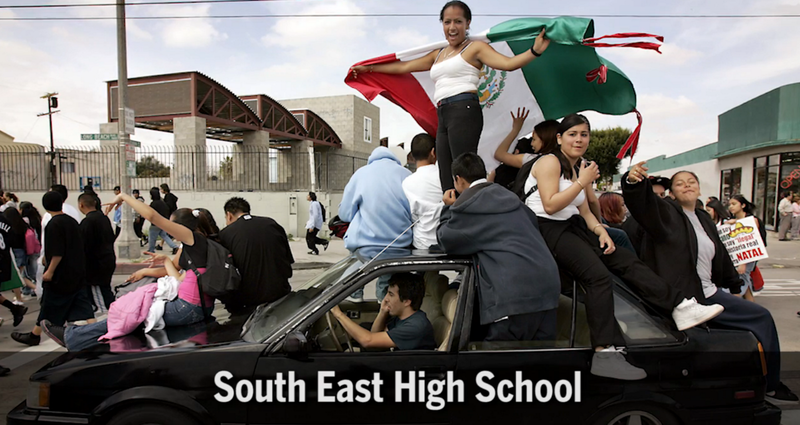 This is how a team at the Los Angeles Times — including social media/engagement staff, videographers, designers and immigration reporters — quickly located hundreds of students who walked out of more than 50 Southern California schools in 2006 and what we did when we found them. 1) We mined the archives. And turned the images into video. 2) We created a callout video and shared it widely. Our most successful effort to generate interest was a tight social video, created from the archival images, asking “Were you part of the biggest protest has California has ever seen?” The video listed the schools that participated in the walkout, which created a sharable hook as young adults found their schools or calledt out that their school was missing from our list. A screenshot from the social video which identified specific schools. More than 11,000 people shared the video on Facebook, and the millennials who walked out tagged many of their friends who participated. In all, the video reached nearly 3 million people and generated more than 8 thousand responses, according to Facebook statistics. 3) We carefully worded our survey. We used the video, an online post, a text callout and social media to direct young people to a form (we used Screendoor) where we asked them to share experiences and pictures from the march. We talked a lot about the questions before posting it, aiming for a clear and conversational voice for people who may or may not have been regular readers of the newspaper or website. Nearly 200 people filled out the survey, representing more than 50 different schools. 4) It’s not scientific, but that doesn’t mean it’s not meaningful. Facebook commenters shared hundreds of memories, and linked to friends. The young people who responded were not a true reflection of the 40,000 or so students who walked out of class. But the widespread response made clear to us that this moment resonated with many people. And we were able to very quickly reach a wide group, compared to finding participants through alumni associations or activist organizations. We also encountered a wide range of fascinating stories, such as a doctor in Mexico who left the U.S. because of her immigration status and a mayoral aide in New York, that we would most likely not have found otherwise. To be clear with our readers, we noted in the text that this was not a representative sample and that the stories were not on the impact of these marches on the group as a whole, but instead how the event shaped the lives of individuals. 5) We tried out different approaches. 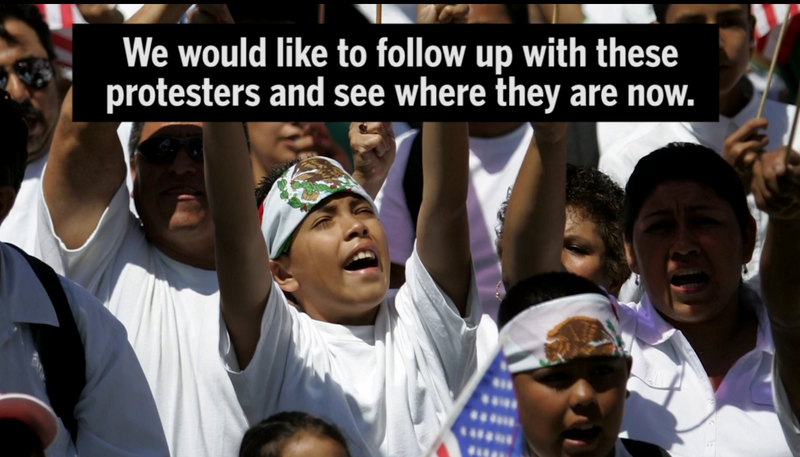 We were interested in potentially doing a wider story on other participants in the marches, and for that we tested out two other methods to reach a population that would prefer Spanish or texting. The first was asking participants to text in their experiences using Groundsource. We also translated our video, callouts and texting into Spanish working with our partners at Hoy. While these techniques did not contribute significantly to our newsgathering efforts, they did help us test out new tools, cultivate partnerships and consider how we could reach a Spanish-speaking audience more effectively in the future. 6) We pivoted and focused our efforts. We also planned to track down the young adults who were in the archival photos and Times coverage, but we changed our approach after reviewing the survey responses. The diversity of experiences supported a richer and more varied project that we could have done limiting ourselves to the handful of stories from young people in archival photos. Instead, we followed up asking respondents to send a picture of themselves at the time of the marches. We provided specific directions for how to do a yearbook photo. Some located their yearbooks, others did not, but these clear directions helped us get the images we wanted. Another earlier plan had been to map the growth of this movement, and each young person was asked to share how they heard news of the walkouts and which high school they walked from. We decided this was focused too much on the history, and visually we needed to focus our efforts. Using social media to collect stories helped us to to locate more people faster than if we had used phone calls and old fashioned shoe-leather reporting, but it also meant we had a plethora of individual accounts to synthesize into a story. 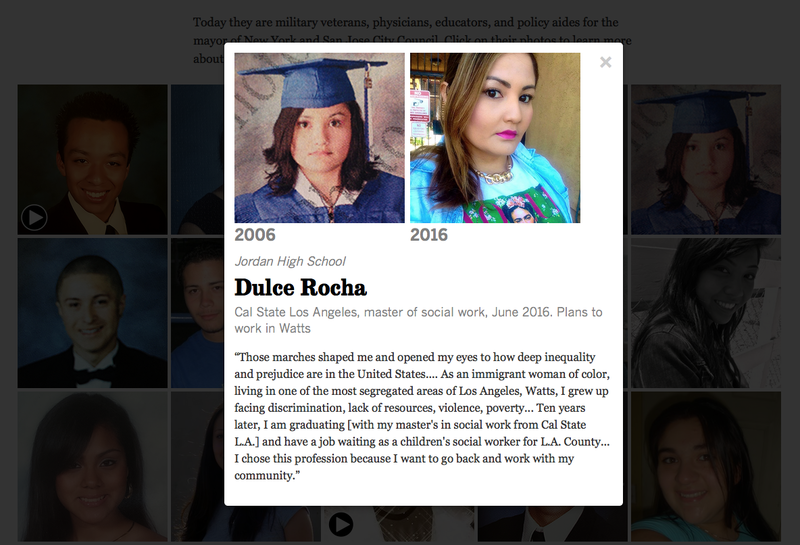 To illustrate the transformation of high school students into military veterans, city government aides in New York and San Jose, university students and teachers, we chose an interactive approach. We selected 25 students’ stories, displaying their image from 10 years ago. When a user scrolled over each picture, it changed to an image of the present with text or video about their lives and how the walkouts impacted them. 8) We were flexible with time hooks. Truth, we started this project late. We put the callout on the anniversary of one of the larger marches, May Day, but we had missed the anniversary of the walkouts in March. Our initial thought had been to run the stories with the California primaries. Instead, we published when the U.S. Supreme Court’s deadlock on immigration was announced. This story uses a moment in time to reflect on social change. If we hit the exact date — March 27 — that would have been great. But the anniversary story is a device to understand the impact of a social movement that can be flexible within a few months. 9) We shared stories with respondents and paid attention to what they had to say.